AMD’s Ryzen Threadripper 2990WX has set a new record Cinebench score (for a single-socket processor) which beat the result that Intel’s as yet unreleased 28-core monster CPU (clocked at 5GHz) managed to achieve at Computex. The prototype Intel processor hit a Cinebench R15 multi-core score of 7,344, whereas the Threadripper 2990WX managed to outstrip it with a score of 7,618, as reported by Tom’s Hardware. That said, note that this isn’t a level playing field – both benchmarks were conducted under different conditions and obviously in different rigs. With its Computex benchmark, Intel used an industrial-grade water cooler, whereas AMD’s benchmark of the 2990WX was fuelled by more effective liquid nitrogen cooling (allowing for the processor to be overclocked to 5.1GHz across all 32-cores). So we can’t draw any concrete conclusions about the relative performance merits of the CPUs, but it’s clear that AMD has come up with something special in this Threadripper offering. What you have to bear in mind is that even if this is an unfair benchmark comparison for Intel, its 28-core processor is expected to cost many thousands of pounds – perhaps even 10 grand according to recent speculation – whereas AMD’s 2990WX nestles in far more affordable territory. As we saw yesterday, this 32-core (64-thread) AMD processor with a base clock speed of 3.0GHz (and boost to 4.2GHz) will retail at $1799 (about £1,380, AU$2,430), a fraction of the likely price tag on Intel’s effort. Indeed, AMD’s 2990WX is cheaper than Intel’s Core i9-7980XE, an 18-core processor which costs $1,999 (about £1540, AU$2,700) – and in Cinebench R15, AMD’s CPU is over 50% faster than the Core i9-7980XE. So, for those who need a really chunky many-core processor – creative types engaged in the likes of heavyweight video editing – the Threadripper 2990WX seems to be a highly compelling offering, to say the least. 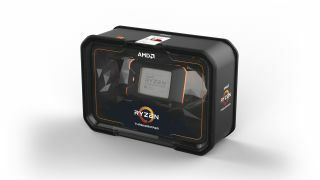 The 2990WX is actually the only one of the four freshly-revealed Ryzen Threadripper 2nd Generation processors which is now available to pre-order, with the product set to ship very shortly on August 13. There’s also the 24-core Ryzen Threadripper 2970X which is due in October, the 16-core 2950X which is scheduled to appear on August 31, and finally the 12-core 2920X which will pitch up in October alongside the 2970X. UPDATE ON THIS CPU: AMD's New 32-Core Ryzen Threadripper CPU is Out -- Get One Free | Digital Trends .